The worship night that was held at a local church in Dunkirk, France was an incredible night. God moved in such a mighty way as the church joined together in song. Andrew had the opportunity to share some of his songs in French! Him and his team have been working on a 5 song EP Tu Es Avec Moi (You are With Me) which is set to be released Fall 2019. What is the purpose of worship? Is there more to worship than what we see in modern day church services? Dr. John Neufeld and host Ben Lowell sit down with two-time Gospel Music Association award-winning singer, songwriter and worship artist, Andrew Marcus, to talk about the state of worship today. You can also listen to Andrew’s latest album, Constant, on iTunes or Spotify. Watch this episode + more, weekly on JoyTV. Check your local listings for times and availability! NASHVILLE, Tenn.—Sharing The Road, an innovative new series featuring in-depth, personal conversations with Christian music’s leading artists, songwriters and worship leaders, will debut on PureFlix.com May 11. Created and hosted by award-winning worship artist Andrew Marcus, each episode of Sharing The Road consists of unscripted, real-life dialogue between Marcus and his guests—filmed while driving in a variety of locales. 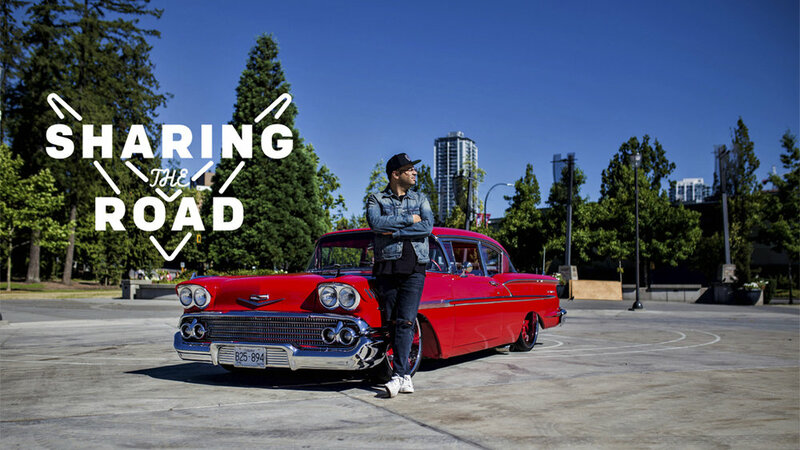 Season 1 of Sharing The Road shines the spotlight on Drew Shirley of Switchfoot; Jordan Feliz; Jon Steingard of Hawk Nelson; Ed and Scott Cash; Montell Jordan; Dan Bremnes; Payden Hilliard of Leeland; Brian Doerksen; Seth & Nirva; Alisa Turner; Randall Goodgame; Matty Mullins; and Zach Bolen of Citizens & Saints. All 13 episodes comprising the first season are available to Pure Flix subscribers. Vancouver-based Andrew Marcus is one of Canada’s premier worship leaders and songwriters. Since his debut in 2007, Marcus has released seven recordings. His acclaimed 2016 release, Constant, featured writing and vocal collaborations with Paul Baloche and Leeland. Produced by Scott Cash and executive produced by Ed Cash, the recording garnered GMA Canada Covenant Awards for Song of the Year (“You Are With Me”) and Praise & Worship Song of the Year (“Glory To His Name”). His latest recording, an EP featuring French translations of five songs from Constant, will release this fall. Entitled Tu Es Avec Moi (You Are With Me), the collection includes guest appearances by leading worship leaders from France. Marcus currently serves as pastor of worship and creative arts at Coquitlam Alliance Church in British Columbia. For further information, visit andrewmarcusmusic.com. Follow him on Twitter, Facebook and Instagram. PureFlix.com (or Pure Flix Digital) is a subsidiary of Pure Flix Entertainment, LLC, the worldwide leader in faith-based entertainment and a Christian movie studio based in Scottsdale, Arizona, that produces, distributes and acquires Christ-based movies. The company’s vision is to positively influence the global culture for Christ through media. Whether it’s on your television, laptop, phone, or tablet, PureFlix.com is your trusted destination for the highest quality family-friendly, wholesome entertainment that’s available anytime, anywhere. For more information, please visit PureFlix.com. For further information on Sharing The Road, follow the series on Facebook, Twitter and Instagram and watch on PureFlix.com. Season 1 of Sharing the Road premieres on PureFlix this 05/11/18 and it is packed with some amazing resources for worshipers both on and off the platform! Sharing the Road includes 13 episodes interviewing Christian artists including Drew Shirley (Switchfoot), Jordan Feliz, Ed Cash (Producer for Chris Tomlin), Hawk Nelson, Dan Bremnes and MANY MORE!! It has been 8 years since Andrew released "Emptiness Speaks Volumes." This was really a faith step for Andrew to work on and release this project after first picking up a guitar less than 2 years prior. The album tells stories from Andrew's journey with the Lord. Check it out online wherever you consume music! Andrew and the team had a great time worshiping with the Berlin International Community Church in Germany for two Sunday morning services. Andrew also got to highlight a few songs and share the stories behind the GMA Covenant Award winning song "Glory to His Name" (Praise and Worship song of the year) and "You are with Me" (Song of the year). Our time as a family together in Brussels, Belgium was unforgettable. I will never forget the moment the entire church came up to the alter in response to the song "You are With Me." It is crazy to realize that every night when we gather for a night of worship, everyone comes with a story. We are all struggling with different things in this life, and I am thankful that we don't have to live this life alone. We gather from all parts of the world to worship a God who adopted us as His own. I had such an incredible time worshiping with this team in France and Belgium. I was quickly reminded on this tour the reality that as believers we are literally family. We are not 'like' family, we are family. We wept when departing from France because we felt like we will be homesick. It is such a joy that we get to do life together and do ministry together as a family. This team was incredible and I cannot wait to spend time together on our Europe tour in 2018! Andrew and the team had an incredible time worshiping at Vineyard Bern in Switzerland. God moved in such a powerful and unique way in each of the services. They served for a Saturday evening night of worship and three Sunday morning services. Andrew's team consisted of the Columbus Band, local band doing amazing things in Switzerland. Andrew's passion is for the Church. Although his main commitment is pouring into his local church, he cares greatly for the global Church. Andrew had the privilege of hosting training events on his European tour this Fall in Switzerland, France, Belgium and Germany. The four our seminars include topics: Worship Leading, Songwriting, Leading a band, Leading the congregation, practical aspects of worship leading and songwriting and spiritual aspects of worship leading and songwriting. Two-Time GMA Covenant Award Winning worship leader / songwriter Andrew Marcus releases his new 90's throwback hip hop album under the artist name "Addition" debuts at #3 on the iTunes inspirational charts during the first week of release. The album includes 7 songs penned and produced by Marcus. The album is available wherever you consume music! Two-time GMA Canada Covenant Award-winning singer/songwriter and worship leader Andrew Marcus releases a surprise single “Lift My Eyes” under the Christian hip hop artist, ADDITION. Spending time in the studio experimenting, Marcus’ long time passion for 90’s hip hop music surprisingly resurfaced. Produced and penned by Marcus, the album releases this August containing seven selections that musically take us back to the 90’s and lyrically teach us the Word of God. “Lift My Eyes,” ADDITION’s debut single releasing July 28th, was written after his father encouraged him to write a song with his favorite Scripture: Psalm 121. With six critically acclaimed recordings to his credit, including his BEC RECORDINGS debut album Constant featuring writing and vocal collaborations with Leeland and Paul Baloche, Marcus has really stepped out of the box with this experimental side project. The multi Covenant Award-winner continues to serve as pastor of worship at Coquitlam Alliance Church in British Columbia. Two-time GMA Covenant award winning Singer/Songwriter and Worship Pastor Andrew Marcus uses two filters when crafting a song: the Scripture, and his home church. Join Andrew on this seven day journey as he points each song from his latest album, Constant, to the Word, and shares how these songs have helped him, his church family, and worshippers around the world connect with God. It has been incredible seeing all that God has done through the title track of Andrew's latest record. Constant (featuring Leeland) has charted this week at #1 on the Worship Charts. Constant was also nominated this past year at the GMA Covenant Awards for Pop song of the year. Spring tour with Dan Bremnes and Love and the Outcome was an incredible success! Jesus was glorified and God's people were encouraged! Andrew got to share songs and stories from his new album Constant as well as sell some exclusive new Merch! 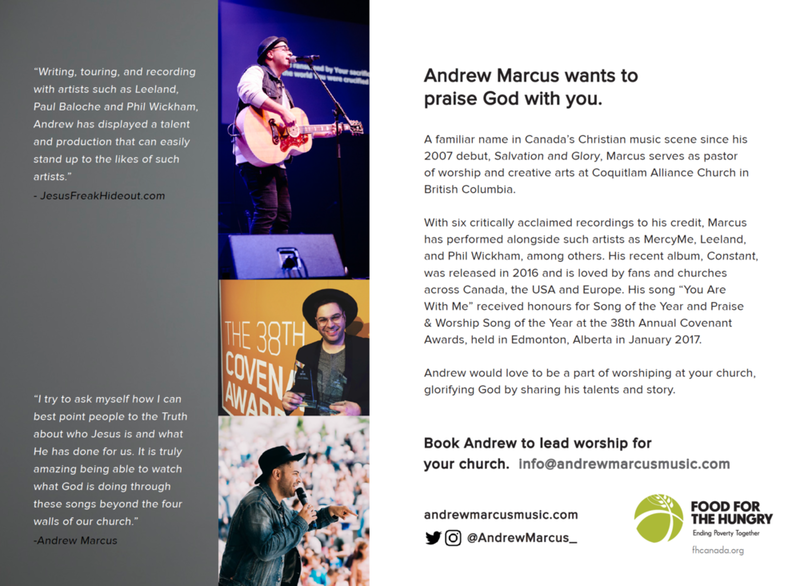 Acclaimed BEC recording artist and worship leader Andrew Marcus received honors for Song of the Year and Praise & Worship Song of the Year at the 38th Annual Covenant Awards, presented by GMA Canada and The World Vision Artist Collective, held recently in Edmonton, Alberta. Marcus’ “You Are With Me,” co-written by Marcus, Paul Baloche and Scott Cash, was named Song of the Year while “Glory To His Name,” penned by Marcus, was named The Trinity Western University Praise & Worship Song of the Year. Both songs are featured on Marcus’ critically acclaimed 2016 BEC Records debut, Constant. Andrew will be joining Canadian artists Dan Bremnes and Love & The Outcome for their spring tour!! Tickets are available at www.danbremnes.com or www.loveandtheoutcome.com. It is going to be a powerful night of worship! Get your tickets today!! CCM MAGAZINE EXCLUSIVE ACOUSTIC PERFORMANCE OF "GOOD TO ME"
Check out the exclusive acoustic performance of "Good to Me" with CCM Magazine. Andrew Marcus and producer Scott Cash chat a bit about the song that was written with Paul Baloche, Ed Cash and Nevin Sawler. It has been overwhelming to see all that God is doing with the first radio single "You are with Me" off the new release "Constant." In November it has received significant airplay on stations across the US including hitting the #1 spot on the worship charts!! "You are with me" has been nominated this year at the GMA Covenant Awards for Song of the Year, Recording of the Year and Video of the year. Praise and worship song of the year "Glory to His Name"
Recorded song of the year - "You are with me"
Song of the year - "You are with me"
Album of the year - "Constant"
Andrew and his band had an amazing time at an old lodge in Coquitlam, BC recording live audio/video resources from the new record Constant! We look forward to sharing these videos with you in the near future. Make sure you check in for updates!! Andrew's first radio single has been getting significant airplay across Canada and the US. It has been getting new ads every week thanks to the BEC / Tooth and Nail Radio team! On the worship chart it hit has high as #2!! If you haven't heard it on your local station make sure you request it! Constant by Andrew Marcus is the newest worship release by the BEC Recordings worship artist based in Vancouver, British Columbia. The project features fellow worshipers Paul Baloche and Leeland and has several fresh new offerings for congregational singing including the radio single "You Are With Me," which was written by Andrew Marcus, Scott Cash and Paul Baloche. The song and album speaks of how God is our constant, and He is with us in every situation. Kevin Davies had a chance to connect with Andrew to talk about "You Are With me." Click the link below to read their conversation! Singer/songwriter and worship leader Andrew Marcus joins host Caroline Lusk (also of CCM Magazine fame!) in Nashville to film an episode of TBN/JUCE TV’s Real Videos. The three-time GMA Canada Covenant Award-nominee just dropped Constant, his BEC Recordings debut and sixth overall studio project. Canadian worship pastor Andrew Marcusreleases the much anticipated full length Constant (buy), which plays more like an EP with added live tracks. With clear and commanding vocals reminiscent of Paul Baloche, Marcus’ latest offering floats like a beacon in the crowded seas of recent worship releases with well rounded writing and stellar arrangements. The instantly sing-able “Good To Me” forces the worshipper to gaze upward (just sing aloud and try not to…it’s a dare), and with collaborations featuring the afore mentioned Baloche and Leeland, it will be no surprise this collection will become a classic. Constant, the label debut from newly signed BEC Recording artist and three-time GMA Canada Covenant Award-nominated singer/songwriter and worship leader Andrew Marcus, bows August 12 in the United States and releases July 29th in Canada.